This combination is particularly suitable for heating applications in lumber dry kilns, veneer log vats, veneer dryers, greenhouses, factories, schools and office buildings. This combination enables these systems to provide a flexible and reliable operation utilizing a consistent “grade” of biomass waste with moisture contents ranging from 30 – 50%. 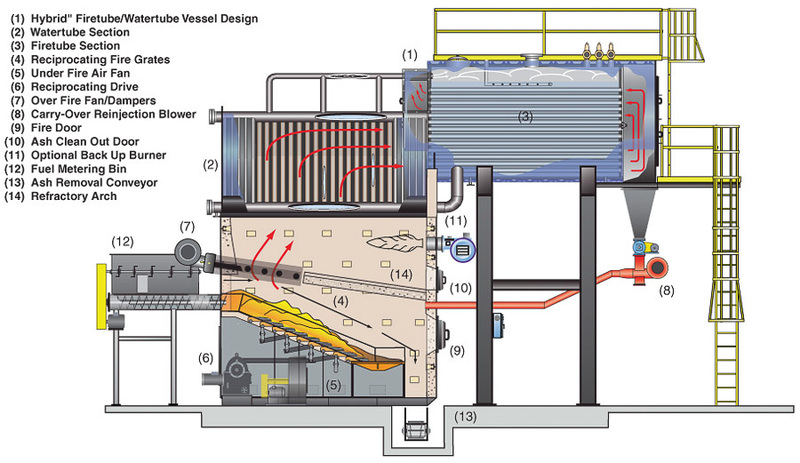 The boiler vessel is a two pass hybrid design incorporating a water tubed boiler-type water membrane and a two-pass fire tube scotch marine vessel. The Hybrid RG design is suitable for applications to produce high pressure steam or hot water in ranges from 3,450 – 60,000 lbs/hr (3.4 mm BTU – 60 mm BTU) output from 100 up to 900 PSI. This system is designed by HBC to combine the best technologies from the “old school” of biomass combustion and the latest advanced combustion control technologies. The new HBC reciprocating grate-type stoker system permits biomass fuels with a high proportion of incombustibles to be combusted in an efficient manner with the added advantage of automatic de-ashing. This combination is particularly suitable for heating applications in lumber dry kilns, veneer log vats, veneer dryers, greenhouses, factories, schools and office buildings. This vessel’s advantages over standard water tube boilers include much larger steam disengagement area providing high quality steam, larger steam storage capability for quicker response to sudden steam demand and much larger thermal storage that provides fast demand response times and safer operation. Hybrid RG can burn biomass fuels, woody fuels, forestry residues, mill residues, agricultural residues, urban wood and yard wastes, dedicated biomass crops, chemical recovery fuels, animal wastes, dry animal manure, and wet animal manure (dairy manure slurry).